HAI (Home Automation Inc), a market share leader in home automation and security product is launching a new application software utility, targeting for home automation segment. Known as Snap-Link Mobile, it enables the use of smartphone to control any home appliances through either WiFi or cellular network at any time anywhere. Just imagine now you can monitor the webcam at home, set up lighting, adjust temperatures and even tighten security with only a few clicks on your mobile devices remotely away from your home. The users will only need to download the software and install into its mobile devices. 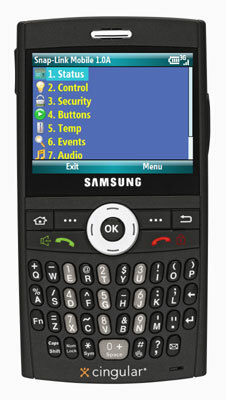 Currently, the targeted mobile devices are only those that running on Windows Mobile OS (Operating system). In order to complete the remote accessing, the users have to equip their homes with HAI home automation system that able to understand control command for proper operation. Not to worry, there are wide lists of home automation control modules being released by this company earlier with various features and pricing requirements throughout its 23 years research and development in this field. Snap-Link Mobile is fully compatible with HAI’s existing OmniPro, LuminaPro and Lumina home control systems. It will be available in commercial market by Q1 of 2008. Before the official release, HAI will be setting a booth during CES event next week in Las Vegas for demonstration to public.